Real Estate Events Plugin for Agents. Seo for Real Estate in conjunction with Agentpoint has developed a plugin that adds the inspection and/or auction times in Google organic results for a property an agent has listed. Using Laing and Simmons in Double bay as a test case we are able to successfully list these times on a Google search for any one of their properties. 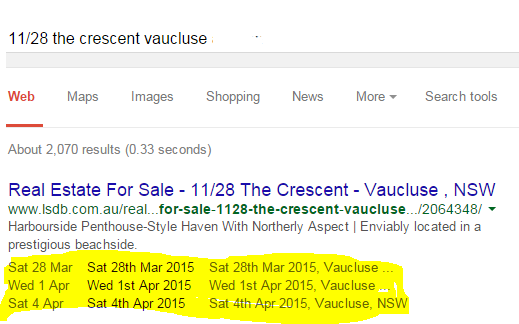 How Google Displays the Inspection and Auction Times. Fully Automated Real Estate Events Plugin. This is a first for any real estate agent in Australia. This is a fully automated feature we have added to the www.lsdb.com.au website. It will help protect their number one ranking for the search term real estate agent double bay. We install the plugin or script onto your site and it picks up all your open for for inspection times. If the property is for Auction it will gather that information as well and display it. The times displayed are a direct link back to the property that is listed on your website. Peter successfully implements technology into the real estate industry helping agencies increase their web presence and online identity. He is a certified Google AdWords Professional providing Search Engine Optimisation, Search Engine Marketing and Google AdWords strategies to agencies across Australia. His offering extends to real estate web design in particular to the niche yet growing area of mobile phone real estate websites. hi very nice blog.real estate event plugin is helpful to property agents when property event is organised by propety dealer.